ECO mode is a function which optimises fuel consumption. It acts on all elements which consume fuel (engine power, heating and/or air conditioning, etc). 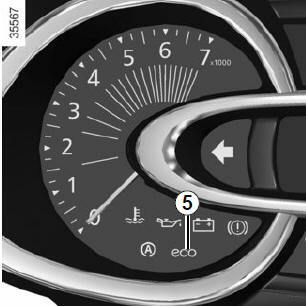 The 5 warning light comes on on the instrument panel to confirm activation. While driving, it is possible to leave the ECO mode temporarily in order to improve engine performance. Depress the accelerator pedal firmly and fully. ECO mode is reactivated when you take pressure off the accelerator pedal. The 5 light goes out on the instrument panel to confirm deactivation.